Chronicles Mark Taylor’s journey from his traumatic work as a firefighter through the evening of election night, 2016. The Trump Prophecy release date was Tuesday, October 2, 2018. This was a 1 Day Only release. Thursday, October 4, 2018. This was a 1 Day Only release. 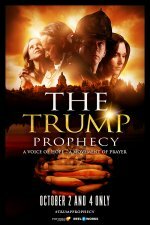 Based on the book, The Trump Prophecies. On April 28, 2011, Mark Taylor, recently retired from a demanding career as a fireman, awoke at 2:00 a.m. Unable to return to sleep, he turned on his TV. Clicking through channels, he stopped at C-Span; the man on his screen was Donald Trump. At that moment, Taylor heard God say, “You are hearing the voice of the next President.” Little did Taylor know, several dozen video recordings of others documented that they also got the same message and were equally convinced it came from God.